This blog post draws on data and research discussed in our entry on Cancer. February 4th is World Cancer Day. Last year we answered the question: "How many people die from cancer?". This World Cancer Day we look at how cancer death rates are changing over time. Global cancer deaths are rising: in 1990 5.7 million died from cancer; by 2016 this had increased to 8.9 million. But it&apos;s also true that the world today has more people, and more older people, who are more likely to die from cancer. To understand what is happening we therefore have to correct for the population increase and ask for the rate – the number of deaths per 100,000 people – and we have to adjust for ageing. When we compare these metrics (shown here) we see that age-standardized cancer death rates are falling globally. Death rates which correct for ageing show a 17 percent decline from 1990 to 2016. Why are cancer death rates falling? 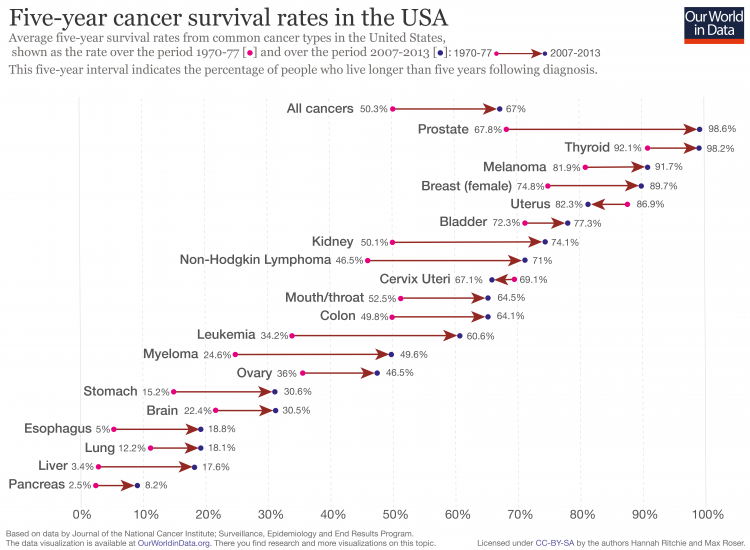 One hypothesis is that cancer prevalence is falling (i.e. less people have cancer). Is this true? Globally, no. The share of people with cancer (even when corrected for ageing) has been slowly increasing in recent decades. Global cancer prevalence has risen from 0.54 percent to 0.64 percent since 1990 (largely due to smoking). In some countries – the US, for example – the age-corrected prevalence has been fairly constant in recent decades (with the rate of new cases actually falling). If death rates are falling but prevalence is rising or constant, then it must be the case that people with cancer have better or longer survival rates. We see this clearly in the USA when we look at the change in five-year survival rates across cancer types. This is shown in the chart below as the change from 1970-77 to 2007-2013. Here we see that on aggregate five-year survival rates for all cancers increased from 50.3 to 67 percent. But we also see significant differences not only in start or end survival rates, but the change over time. Prostate cancer has close to 99 percent five-year survival, but has also seen major progress from a rate of 69 percent in the 1970s. In contrast, pancreas has low five-year survival rates at 8.2 percent, up from 2.5 percent. There are two key factors which could contribute to improved five-year survival rates: earlier detection and/or improved treatment. Defining the exact attribution of each is difficult, and varies depending on cancer type. But there have been some studies which have attempted to do so. Scott Alexander published a very good overview of the relative impact of detection versus treatment here. Tumours have gotten smaller in recent decades – the result of earlier detection. Studies have shown that this can account for a significant share of survival improvements: one study attributed early detection as 61 percent and 28 percent of improved survival in localized-stage and regional-stage breast cancer, respectively3 But even when correcting for size and early detection, we have seen improvements. This suggests better treatment has played a role too. In both detection and treatment, we&apos;re seeing progress. This is important because of the large toll of cancer: Globally every sixth death is due to cancer – this makes it the world&apos;s second largest cause of death. Progress here is important for many. Jemal, A. et a. (2017). Annual Report to the Nation on the Status of Cancer, 1975–2014, Featuring Survival, JNCI: Journal of the National Cancer Institute, Volume 109, Issue 9, 1 September 2017. Rutter, C.M. et al. (2013). Secular Trends in Colon and Rectal Cancer Relative Survival, JNCI: Journal of the National Cancer Institute, Volume 105, Issue 23, 4 December 2013. Elkin, E.B. (2005). The effect of changes in tumor size on breast carcinoma survival in the U.S: 1975–1999. Cancer. Volume 104, Issue 6.